When we approached the team at CenturyLink Field – home of the Seattle Seahawks – to provide them with a best-in-class selling tool to showcase their spectacular event spaces, we knew they already had limited experience with immersive content through the virtual tour on their website. We explained how immersive visuals can work to increase sales and showed that virtual tours are not a high return way to utilize 360, 3D and virtual reality content; simply showing a virtual tour isn’t enough to wow prospects and provide a white-glove sales experience. If that were the case, everyone who featured a virtual tour on their website would continue to see increasing returns. Ultra-luxury and larger-than-life venues, such as CenturyLink Field’s concert venue, WAMU Theater, and the stadium’s private club lounges, now demand a new class of customized sales experience. TrueTour is the platform that can immerse prospects into these exclusive spaces with the click of a few buttons. The power to curate and showcase 100,000+ square feet in an immersive 3D and interactive 360-image environment blended with any number of other visual features, gives the team the ability to sell these spaces to their global audience as if they were right beside them. Using TrueTour™, every member of the sales team can deliver curated proposals into the palms of their prospect’s hands – literally – via custom text or email. They can tailor their immersive sales guides to their prospects instead of simply emailing a generic PDF or asking guests to “check out the website,” simple but inefficient methods to communicate and sell. Instead of making their prospects do the labor, now the team can guide the customer’s visual journey based on their precise event requirements, include links to book immediately and track the TrueTour content delivered with proposals as it’s shared with decision-makers. Leveraged correctly, TrueTour adds the opportunity to reach out and make more meaningful one-on-one connections. Replacing a simple virtual tour with a selling tool, TrueTour allows CenturyLink Field to include interactive content within their 360 imagery for immersive storytelling and showcase multiple real-life event setups for individual spaces. The emotional resonance of this true-to-life imagery is reason enough to invest in TrueTour. As real-life imagery still provides higher ROI than simple 3D modeling, capturing a 360 view of their space completely staged for their most unique events provides lucrative potential. With our photographers ready to drop by within 48-hours’ notice (a service provided to every Visiting Media customer), Visiting Media provides an essential service which will evolve the customer’s vision of what’s possible in an expansive and versatile space. 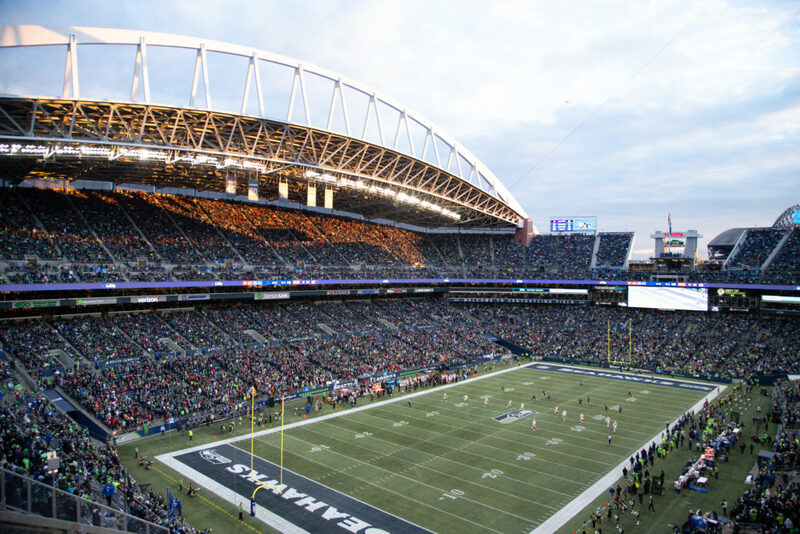 Not only is CenturyLink Field cognizant of the changes rapidly occurring in the digital world, but they’re evolving to meet the needs of the physical world as well. As CenturyLink Field continues striving toward sustainability, Visiting Media is proud to provide a paperless, digital venue sales tool which aligns with their green initiatives. Subscribe to our newsletter and follow along on our journey to bring CenturyLink Field to life! Interested in learning how Visiting Media can take your event sales to the next level? Contact us today to schedule your free demo.